Sorry for the poor quality of the above picture, folks, but old photos fade in strange ways. Thought some of you might be interested in seeing it, though, as it was made at the old North St. Elmo Grammar School, which stood just north of the train trestle on the edge of the community. My mother treasured this picture because it included her brother, Chester Dean Young - the boy kneeling at extreme left. Standing behind him is (Col.) Creed Bates, who liked to introduce himself as the "son of Squire Bates", already a prominent citizen in town. The photo also shows Frances Few, Kate Gothard (Kellerhals), who was my mom's best friend. 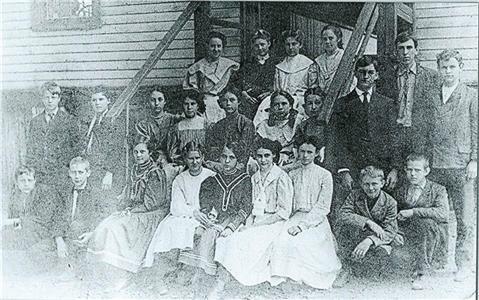 Mabel Young (my mother) is the girl seated beside the banister at right, and appears to have a black eye! Tall boy standing at right was a Krichbaum, who later became the father of our long-time Belvoir Neighborhood neighbor, Nell Krichbaum Connally. Short boy at extreme right is Tom White, my Uncle Chester's best friend, and who later owned a grocery store on St. Elmo Avenue a block or two south of St. Elmo United Methodist Church. Wish I could identify more of those shown in the picture, although anyone desiring help in figuring out who was who, please contact me. My memory is occasionally joggable, and I might be able to help you with someone's ID.